It’s been a long and arduous trip, but Nashville finally has a new Director of Schools. 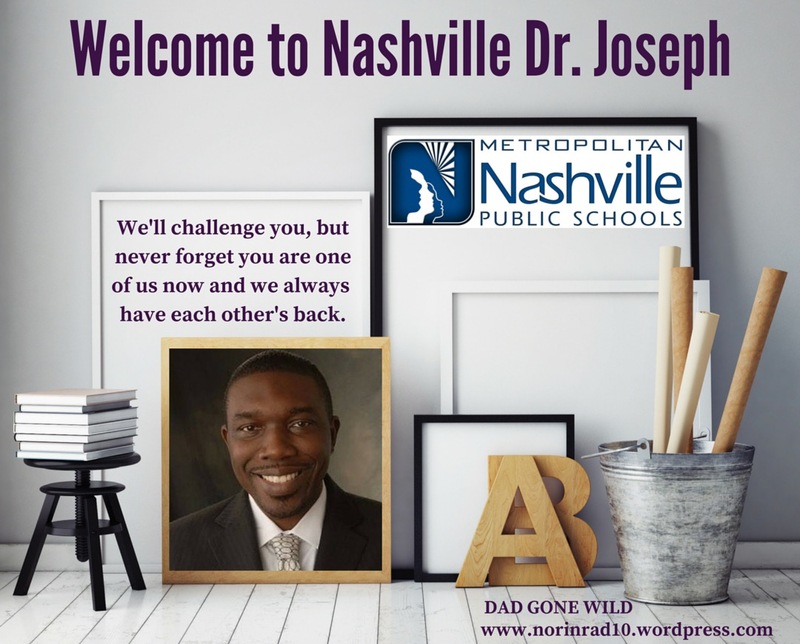 The Metro Nashville Public School Board offered the gig to Dr. Shawn Joseph, currently the deputy superintendent from Prince George’s County Public Schools in Maryland, and he accepted it. With that acceptance, Nashville released a collective sigh of relief. The search for a position of this magnitude is never an easy one, and this one has had more then its fair share of twists and turns. First, there was a battle over who was going to be the interim director while the search was conducted, and that involved an ethics complaint, that, to my knowledge, has never been addressed. Then, the initial search ended with an offer to Williamson County Schools Director Dr. Mike Looney, who promptly turned it down and decided to stay in Williamson County despite having a signed letter of intent. This led to the questioning of the initial search firm and the competency of their work. The search was restarted, a new firm hired with the bill footed by a private entity, the Nashville Public Education Foundation, and community involvement was sought. A slate of finalists was unveiled sans any women candidates and again questions arose. In the end, though, there was one clear choice and the board voted 9-0 to offer the job to Dr. Joseph. Quite the whirlwind. But we now have closed one chapter and before we open the next, I think this is as good a time as any to reflect on what it all means. I’ve always liked those winner/loser articles, so this is going to be my attempt at such an endeavor. Before I begin, let me just give the caveat that these are just my opinions from the cheap seats, and they are not intended to be gospel. Your take make be a little different, but then again, maybe not. Let’s start with the students, parents, teachers, and the general Nashville population. This is a big win for them. After a year in limbo, we will now have somebody firmly at the helm. Chris Henson did an admirable job but his strengths lie in finance, not running a large school district. We need to say thank you to him for his going above and beyond the call of duty, but it was time to get a highly qualified educator in the chair. By all accounts, Dr. Joseph is a high quality educator with a proven record of delivering results. He may lack a little in experience but that will be augmented by a couple of very accomplished former superintendents whose experience he will be able to draw on, Dr. Jerry Weast and Dr. Elizabeth Morgan. Dr. Joseph has suggested that Dr. Morgan will head up his transitional team. Dr. Joseph has touted the power of the book Leadership and Self-Deception. So it is now resting by my reading chair. The hiring of Dr. Joseph represents a big win for Nashville’s newly-elected mayor, Megan Barry. The city looked to her to be a calming hand on a calamitous process and she played it perfect. Her involvement in the process struck the proper balance between intervention and letting the board do its job. Getting this done in her first year helps set the tone for the rest of her term. Kudos to the mayor on a big win. Also taking a place in the winners circle is the MNPS School Board. There were voices in the community that questioned whether or not they were capable of getting this done. Right up to the end, those voices were attempting to detract when support would have been more appropriate. Thankfully, the board tuned out those voices and went on about their business. Despite the perception of being a divided entity, they agreed, within 30 minutes of deliberation, to offer Dr. Joseph the position with a vote of 9-0. A tip of the hat to the board and I don’t envy the task of the challengers in this years school board elections. A win like this hardly makes an argument for change. In my opinion, the hiring of Dr. Joseph also represents a big win for a few individual board members. Dr. Sharon Gentry, whose leadership has often been questioned, led the board across the finish line and delivered a historic hire. In the words of vice-chair Anna Shepherd, “This is a historical moment that we have a director of schools who looks like the majority of children in our district.” This is big and should give Dr. Gentry a huge boost in her re-election campaign. Hopefully it is an indicator of the way business will be conducted in the future and not just an outlier. Board members Jill Speering, Amy Frogge, and Joann Brannon also deserve recognition for the courage they showed in speaking up about the lack of female candidates for the director position. This being an election year for Speering and Frogge, it would have been easier for them to just remain quiet when questions about the selection process arose. Instead, they demonstrated that they clearly valued children and teachers over election results. They spoke out despite criticisms and calls to not risk the outcome of the search process. They refused to adhere to these calls because they were committed, above all else, to ensuring that Nashville got the best director of schools possible. Dr. Joseph himself was supportive of their efforts, saying, “I commend them for putting it on the table.” So do we. That’s what leadership looks like. The Nashville Public Education Foundation and Shannon Hunt get to put this in the win column as well. They’ve received accolades from the mayor and all candidates during their interviews. I’m sure we will see more from them going forward. Despite the success of this search, in the future it would be nice to see more transparency. For example, in this case, who was on the list of candidates recruited, what was the actual cost of the search, what did those costs entail, who had influence on selecting the finalists – those are things that the public should know and unfortunately, in this case, they don’t know. Maybe in the future they will release a more detailed review of the search. I hope at some point the board asks for it. Above all else I hope that NPEF will use their new found clout to ensure that all our schools are given the support they need and not to act as a non-elected wing of the school board that pushes the agenda of special interests. The jury is still out on what the hiring of Dr. Joseph means for our English Language Learner students. It is not a criticism to say that Dr. Joseph lacks experience with urban schools and Nashville’s ELL population is a very unique blend of immigrant and refugee children. Too often the general public translates ELL into Spanish students and while Spanish speaking students make up a large segment of our ELL population there are so many other languages and dialects represented. Over the last couple years the ELL department under the guidance of Kevin Stacy has been a shining star and a source of pride for the district. This year saw the unveiling a very impressive and ambitious plan. I pray that Dr. Joseph recognizes the fine work Stacy and his department are doing and continues to support them. Our children have made too much progress and the work is too important to let it fall to the side. Which leads me to the only loser in these events: those who believe in a transparent democratic process. I fully understand the difficulty of this undertaking in full daylight, but there is a reason that we have sunshine laws and why they are essential to building trust in governance. The one thing that MNPS presently suffers from more than anything else is a lack of trust. Administrators don’t trust teachers. Teachers don’t trust administrators. Nobody trusts central office. The public doesn’t trust the whole system. You can deny this all you want, but the fact remains, the culture of MNPS is one of distrust, and that needs to change immediately. You will be hard pressed to find someone more enamored with Nashville’s public schools then myself, but this lack of trust is truly hamstringing the district. For two long people have been allowed to put their personal agendas ahead of what’s good for students and the system. It’s gotten to the point that teachers are constantly in fear for their jobs and afraid that if they question a policy or if they pause for a moment from the pursuit of the standards to address a child’s inquisitiveness they will be non-renewed and declared ineligible for rehire. How is it possible to instill a love of learning when there is only fear and no joy in Muddville? To be fair to principals, they are hard pressed to find a model of leadership that instills trust in those above them in the hierarchy. This needs to change immediately. We will never be in the top echelon of school districts if we continue to ferment this distrust. The recently concluded search was a missed opportunity to clear away some of that mistrust. A process that should have been completely transparent and above board failed to pass the smell test. What was the real reason Carol Johnson wasn’t made a finalist? Did H. Allen Smith really get a fair interview when what can only be categorized as a hit piece ran two days before his interview? How about one of the 6 semi-finalist not having a degree higher then a BA? How did he end up as a finalist to run one of the largest school districts in America and what role did past personal relations play? Leon, as executive director for Teach for America, was responsible for TFA, a personal favorite of former Nashville Karl Dean, coming to Nashville. Then let’s not forget my personal favorite incident, the semi-finalist who withdrew and expressed his intentions through tweets that were read to the board by the head of the search committee. These actions seem to lend credence to witnesses’ assertions that Board Chair Gentry admitted to board member Frogge in a side conversation that candidates had not been vetted. I don’t want to get into a finger pointing exercise here because those who’s actions made the selection process less then transparent are well aware of the choices they made. They may be comfortable with those choices, but there is a new sheriff in town and hopefully he brings with him a new way of doing business. Dr. Joseph has already proven savvy enough to insist that an addendum, number 6, be added to the contract establishing ground rules on the way the board communicates with MNPS and the director himself. There won’t be a repeat, for example, of the open warfare that erupted between board member Will Pinkston and the former director Jesse Register. Pinkston’s actions may have been justified but they didn’t help build trust in a system that is seriously lacking in that department. It’s way past time for leaders to model behaviors that inspire trust. Dr. Joseph arrives here officially on July 1, but is already working to learn his new district. There will be a great deal of focus on how he will manage Nashville schools. I hope he remembers what he said during his interview about collaboration. Without trust, none of that collaboration will be possible. Though if, during his tenure here, Dr. Joseph does nothing but restore trust to the system, then he will be head and shoulders above the district leaders of the past 15 years. Trust can only be restored through transparency and collaboration. Collaboration must also include people we may disagree with. We don’t need to chase people out of the game; what we need to do is find a way to work together to get the best outcomes for all stakeholders. It is my hope that sooner rather then later, Dr. Joseph sits down with teachers and truly listens to what they have to say. They have been ignored for too long. Principals and parents need to feel validated as well. In closing, welcome to Nashville, Dr. Joseph. I think you are going to like it here. You’ll be hard pressed to find a more committed, passionate, and welcoming people anywhere in the country. We’ll challenge you, but never forget you are one of us now, and we always have each others back. This is going to be a great run.